NORMAN — As a state, Oklahoma nearly swept the Associated Press' top four All-Big 12 postseason awards. A day after being named a Heisman finalist, Oklahoma wide receiver Dede Westbrook was named the Big 12's offensive player of the year by the Associated Press. Coach Bob Stoops was tabbed as the conference's coach of the year for a record fifth time. Oklahoma State Running back Justice Hill was also named the conference's newcomer of the year. OU placed seven players on the AP's All-Big 12 first team and four more on the second team. Westbrook was also a unanimous selection to the AP's All-Big 12 first team along with Texas' D'Onta Foreman, Kansas State defensive end Jordan Willis and West Virginia cornerback Rasul Douglas. Quarterback Baker Mayfield, offensive tackle Orlando Brown, running back Joe Mixon, tight end/wide receiver Mark Andrews, linebacker Jordan Evans and cornerback Jordan Thomas were all named to the first team. Running back Samaje Perine, offensive guard Ben Powers and linebacker Ogbonnia Okoronkwo were all put on the second team. Mixon also landed on the second team as an all-purpose player. Oklahoma State was also well represented in the postseason honors, placing three — receiver James Washington, defensive tackle Vincent Taylor and safety Jordan Sterns — on the first team. OSU also had five players on the second team: offensive tackle Victor Salako, tight end Blake Jarwin, linebacker Devante Averette, kicker Ben Grogan and punter Zach Sinor. Kicker — Ben Grogan, Oklahoma St.
Coach of the year — Bob Stoops, Oklahoma. 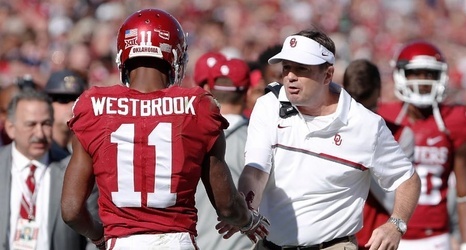 Offensive player of the year — Dede Westbrook, WR, Sr., Oklahoma. Defensive player of the year — Jordan Willis, DE, Sr., Kansas State. Newcomer of the year — Justice Hill, RB, Fr., Oklahoma State. Stephen Neal retires with "dignity and class"
How hard will they try to re-sign Rex Burkhead?